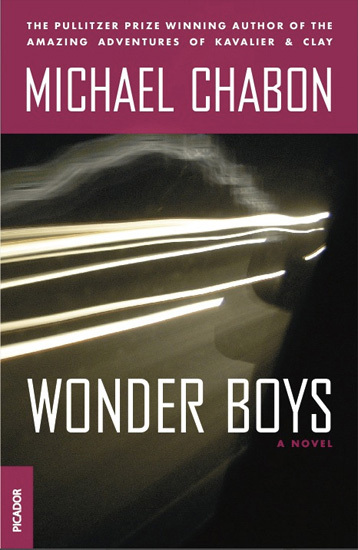 Michael Chabon has been a fixture of my literary exploits for the past few years now. He originally won a place on my bookshelf solely based on a wonderful bookcover for “The Amazing Adventures of Kavalier and Klay.” Since then he has not disappointed with “Yiddish Policemen’s Union” or any of his other novels which pair great writing with great book-covers. That was until I picked up “Wonder Boys.” Now it is by no means a horribly ugly book cover but hot pink, lime green and a mustard color aren’t exactly members of my favorite color scheme. The naive handwritten type wasn’t helping it either. 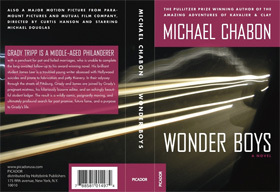 Completed for a photography class my revision of the “Wonder Boys” cover uses the typeface Agency like many of Chabon’s other covers. It uses all of the same text that appears on the original cover and photo used is a long exposure taken out the window of a car which references several scenes of diving in ‘altered states’ in the novel. For the project I also completed a back-cover and spine pictured below.